So I’m sitting here in the chemo ward and starting to feel slightly depressed at the memory of the night Dr. Latour and Dr. Nelson gave us The Diagnosis. There doesn’t seem to be any new kid coming, and I can’t just sit here for the next three hours remaining of toxic chemicals being administered to my perfect little boy feeling down. I look at Martin, and he wisely feels my stare and looks up from his phone. He smiles. I ask what he’s reading about on his phone. He excitedly starts to explain to me all about a new gadget that is coming on the market soon (possibly a mobile phone, but because he doesn’t use that expression for it and instead says the Android 4 point something I am left to wing it) and how it will be in Europe soon but the problem is they are already working on the next version so he is not sure if he should buy this one or wait for the next one. I’m smiling and nodding and trying to make appropriate comments. It’s a bit like our conversations about wine. He is European and has clearly not really noticed that I’m Canadian. You could give me some cough syrup and tell me it’s a vintage 1995 and I’d drink it. If it’s not beer, our whole country is just faking it. He actually knows a lot about wine, and in true Scandinavian form, he is willing to pay a lot for the good stuff. In true Canadian form I have trouble paying more than 50 dollars for anything that doesn’t come with an engine. People have asked us how we are holding up, how our relationship is doing. This type of crisis could easily cause a marriage to rupture at the seams, crack under all this pressure. It’s strange though… This whole thing has actually made us stronger. I would have rated our relationship pretty high on the “gonna work” scale, (as opposed to the “doomed to self-destruct scale.) In any case, I think we have reached a new level in our marriage. We were lucky to already really happen to like each other basically just as we were. It’s actually possible that Martin sees right through my Canadian wine-and techno fake act, but keeps right on talking because he thinks I’ll see the light if he just keeps explaining the advantages of the Google Android line of product over the Apple religion…It’s true that when I start to ramble about literature or parenting or schooling he listens as if he actually shares my passion. So maybe he’s faking it a bit too. In any case, my point is, we have actually gotten closer. So that is one to put on the list of Cancer Pros. We already know what’s on the Cancer Cons list, so there’s no point even writing it. The Pros list is much more interesting, and challenging to come up with. Like, for example, the shampoo savings! The close friendship I have developed with my pharmacist! The medical lingo I have acquired! The vomit stain removal expertise skills! The fact that little things don’t stress me anymore! The shared battle against this cancer I am fighting with my husband… no exclamation point. He does amaze me. Like Elliot, he has shown a strength I can only admire. I know why he is talking about the phone now (it could actually be a tablet, now that I listen a bit more carefully). It isn’t because he is unaffected by where we are and what is happening. It’s because these things make him happy, and he needs to cling to anything that brings him close to feeling happy, even close to feeling ok. So I am thrilled to hear about the gadget thingy, and I wish I could just go out and buy it for him myself. That, by the way, would be counter productive, as apparently the search for the exact right gadget is part of the thrill, so if I bought it that would ruin the chase. Good thing he’s not a womanizer, or I might be in trouble. I don’t mind competing against Androids. Oh that totally came out sounding the wrong way. Is it ok to giggle to yourself while you sit in the chemo ward with your child getting his dose? What are the odds someone will notice and think I’ve lost it? Ok here’s the real question, what are the odds I have? Martin decides to go down to the coffee shop and get us some more coffee. I ended up reading a book and playing a puzzle with Elliot after all (turns out I am actually competitive). And now Elliot is back to watching a movie on the Ipad again. The Rude Mom’s daughter has fallen asleep, the mom is staring out the window. I consider talking to her, but I think she needs time. Talking to me would make her feel too much. Looking at Elliot would make her think about her daughter’s imminent hair loss. She is not ready to be part of the Cancer Moms social club yet. She stills holds onto that normalcy myth, and isn’t quite stepping into our world yet. Some people would call it denial. It’s really actually just part of acceptance. The Smily Girl and her mom are getting ready to leave. Smily Girl has been in treatment since last summer, and “only” has another year or so to go. The nurse comes in to remove the chemo needle. These are the bad times. The needle is sticking out of the port-a-cath, which is a small box inserted under the skin on the upper right chest. The port-a-cath is connected to a vein, so that the chemo can be administered easily. Most children receiving chemo have a port-a-cath, which is installed surgically before the treatment starts. It spares them the need to have an i.v. inserted in the fragile veins of the arm or hand every time. Ah, the miracles of modern medicine. Before this, many cancer patients suffered terribly from the damage the chemo would do to their veins, or even, worse, from the chemo medicine spilling out onto their skin, and destroying large patches of it within seconds. The only thing is, a needle needs to be popped into the port-a-cath for each treatment, and removed after. Apparently it doesn’t hurt much. The kids beg to differ. They all, universally, freak out when it’s time to insert or remove the needle. So the nurse comes in, goes to their bed and cheerfully says it’s time to remove the needle, the chemo is done. Smily Girl freaks out. The nurse tries to reason with her. The mom tries to calm her. The tray of bandages and syringes the nurse was carrying almost goes flying, but she catches it in time and places it on the table. These nurses are pros. She never loses her smile. The mom holds her daughter’s legs and the nurse holds her arms with one hand, then somehow yanks the needle out with the other. Smily Girl’s screams reduce to a whimper. Mom releases legs. Nurse continues to smile and says something about how brave Smily Girl was, while quickly applying antiseptic and a bandage. The bad moment is over. The mom and I happen to exchange glances, and we start laughing, then nervously stop, feeling the inappropriateness. Smily Girl says she wants ice cream as soon as she gets home. Mom agrees breathlessly, running her hand over her daughter’ thin wisps of hair. 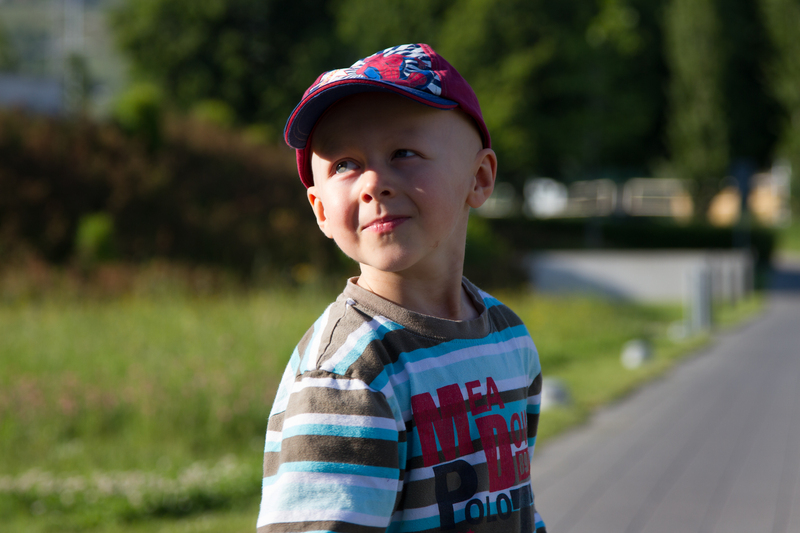 Parenting when your child has cancer is a whole new ballgame. All the rules are out the window. Forget all the ideas you had about chores, food, television watching, video games, bedtime, sleeping in their own bed, buying toys for no reason… It’s a free for all. I’m not sure how we are ever going to get back to any kind of normal discipline or rules at our place. Elliot heard all this, arrived home after the first week in the hospital, declared himself King and has been ruling with an iron fist ever since. It’s actually quite lucky that we never had junk food at home, so he doesn’t know about it, because he basically eats whatever he wants, whenever he wants, however he wants… Non stop! I almost feel like putting in a complaint with the hospital, they told us his appetite would be reduced, and he’s still eating us out of house and home, just like the other two, who grumpily are not allowed to have breakfast while watching a movie. Of course, there are also those times when he just lies on the couch refusing most food, so we feel he is entitled to some freedom of choice the rest of the time. The chemo is done soon for us too. We get home late that day. As we pull off the highway at our exit Elliot looks outside and says in a surprised, innocent voice “Hey, I didn’t even get sick this time!”. Martin and I are exhausted. Elliot decides to ride his bike from the car to the front door because his feet are “too tired to walk”. Once inside, he announces he will watch two tv shows and then play with his lego, and he would like a sandwich while watching tv please. Martin makes a b-line for the coffee machine and I get busy with the peanut butter and jam. You get the picture. Yes, being a Cancer Mom is “that bad”. It has reduced me to a quivering mess, collapsing to the floor because my legs gave up trying to hold me steady. But no, it’s not “that bad”. It forces you to see what’s important. To live in the moment. To appreciate. To slow down, and take a breath. To realize that we are all on the same road, with the same destination. It’s just the length of our road that’s unknown. A month goes by, with more chemo ward trips, more doctor’s visits, more life. Today is The Big Day. Elliot had a CT scan a little while ago and now we sit in the waiting room, waiting for our doctor to call us in for the results. They do the scans every three months, to check for any signs of relapse. This morning we were all kind of crazy. Picture your typical morning, maybe you have to get the kids ready for school and yourself ready for work, your husband also rushing around getting ready. So there is the normal morning madness as everyone struggles to get out the door in time (or as the parents struggle to get everyone else out the door). But to spice things up, in this case, both parents are kind of insane, the anxiety of the past month having built up to the point of almost drowning in it. We should almost install a video camera in our home and later watch the whole scene on fast forward, it would probably make us laugh till we cry. Or cry till we laugh. Elliot did ok until we got to the hospital. Then he took one look at the CT scan machine, crossed his arms, and declared he would have no part of it. We remembered only then that he had actually been asleep for his first scan. Not an option this time. We beg. We bribe. We get angry. He holds firm. When asked by the patient-at-first-but-now-starting-to-lose-it technician why he won’t do it, he replies “because the machine looks like a big metal bagel and I don’t want to be squeezed through a big metal bagel”. I swear I’m not making this stuff up. Roughly 20 minutes later (or 5 years, depending on how you count stress-minutes) he finally caves. Deep down, even though he is only 5 years old, he knows this is important. Making a fuss is his only way to have some control over the situation. And now we sit here and wait for the results. Martin is staring at his mobile phone, unblinking. Elliot is sitting next to him reading a book. I am pacing. Pacing has become my main form of exercise, I am pretty sure I have burned thousands of calories with this little known fitness regimen. I watch people come and go, the anxiety buzzing through my body like really loud tinnitus. I’m pretty sure if someone touched me right now I’d give off an electric shock. I see a little bald girl run by, she looks vaguely familiar. I pace toward her. She has run into the chemo ward and I follow her in. I almost bump into her mom, who is now helping her onto the scale. It’s Rude Mom. She doesn’t move while the nurse waits for the scale to register the girl’s weight, both of us riveted by the red digital numbers. Then after the numbers settle, Rude Mom breathes out and looks up, recognizing me. She smiles and says hi. I ask how they are doing. She laughs and says fine, although the steroids her daughter is on has turned her into a little monster! Laughs again. We chat a bit. Another mom and child come in. We both say hi, but the mom doesn’t answer, just holds tightly to her long-haired boy’s hand and waits for the nurse to come back. They stand there, awkwardly, in the middle of the room together, like a little island surrounded by deep blue sea infested with sharks. Rude Mom and I look back at each other and both think “newbie”. We don’t say it, and yes, I can now read her mind. She has joined the Club. Without actually hearing it I sense we are now being summoned into our doctor’s office, so I speed back out into the hall where Martin is standing up and staring at me with that look on his face that is panic mixed with his “everything is going to be alright” expression. Dr Latour is the one who escorts us into the office, but as we walk in I see Dr. Winters sitting behind the desk too. Oh my, a double date, we must be pretty special. A moment of panic while I hope we are special for all the good reasons, not the bad ones which might be interesting for an oncologist. Dr. Winters is staring at the computer, his hand scrolling the mouse, but looks up when we walk in. “It’s really good news”. He says. It does look like a bagel, good news, great stuff! – Au fait, je crois que j’ai beaucoup de chance dans la vie. Bravo Nicole! Encore une réussite! Littéraire et médicale…. Oh you had me from start to finish. I have to get in the bagel in July, but we have a daisy field illuminated on the ceiling at my hospital… Probably wouldn’t help. I know how hard it was to get stitches into my eldest when he was 6, and how hard to get them out of 3rd son when he was the same age. Lois in Hamilton. Hahaha thanks Lois, it’s nice to hear from someone who can relate to the bagel! Thanks for reading, and for the message! Ah – good news! Good to hear good news! I hope you and your family are doing well after all of that bagel machine scan – what a moment. No wonder you don’t remember anything else. Good news is all that matters. A heaping big-hearted congratulations to Elliot, you and your family. I could say this was another excellent post (wine, androids, and joining clubs), but will rather say that this is excellent news. Hi Catherine, Thanks for the message! It was “just” an interim Ct scan, so we were not expecting it to be anything but good, but for some reason we get pretty stressed anyway. They next one is more important, at the end of treatment probably in July so not that far away. And if that’s one’s good, then we only have to do them every three months. Roller coaster of emotions! !